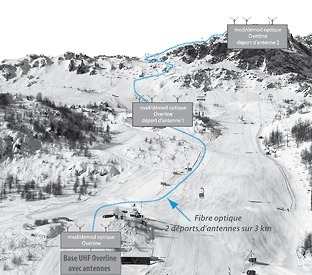 For the 2009 edition of World ski championship held in Val d'Isère the challenge was great: We had to equip 30 technicians of France TV on the stretch of the 2 ski of Women's and Men's tracks ( the 3km of descent on Bellevarde and the 2,2 km on Solaise run). All of the difficulty resided in covering the event along the run's hilly landscape, indeed this broken ground creates shading for the HF cutting the transmission. Because of the stakes, the France Television team called in a company who was on the top of the podium UHF transmission. The only solution, which can be applied on such a long distance, is to deport the antennas by optical fibre, a technology that enables to deport the signal on more than 20 km without any loss. Slaloming between the craggy slopes of the radio frequency, the UHF signals are transported thanks to an ultra linear optical modulator/demodulator, and this without passing by a digital converter that would wear out the signal.